Domain of the current products APHRO_MA/ME/RU_V1101 and APHRO_JP_V1207. 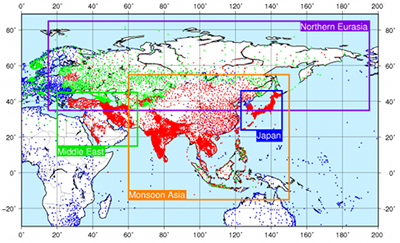 Red, green and blue dots show stations corresponding to original rain-gauge data individually collected from local organizations, derived from precompiled datasets, and derived from global telecommunication system reports, respectively. All Users can download current products from DIAS (Data Integration and Analysis System). Registered users also can sign-in this webpage. APHRODITE's Water Resources. All rights reserved.